Labour’s Trade and Defence spokesperson, Phil Goff, today concludes a week long visit to the United States. 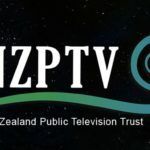 “With TPP negotiations at critical point, the visit was an opportunity to be briefed on the state of those negotiations and to press New Zealand’s interests and concerns. “ Phil Goff said. The visit included meetings at the Department of State, Defence, and the Office of US Trade Representative. He also held discussions at Congress and with New Zealand exporters, US businesses, and independent trade experts. “Particularly valuable was an hour-long discussion with US TPP Chief Negotiator, Barbara Weisel, who I’ve worked with extensively in the past. 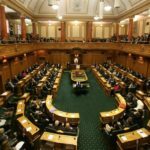 “New Zealand’s bottom lines in a TPP include removing obstacles to New Zealand trade in agriculture and other goods and services in key markets like Japan, Canada, the US, and Mexico. “Attempts to achieve bilateral free trade agreements with these countries have previously failed because New Zealand is a small market which has already removed most tariff and other barriers. Agricultural interest groups in each of those countries fear the impact of freeing-up entry to NZ’s efficient agricultural exporters. “I also argued for a TPP which provides safeguards for genuine concerns raised about provisions which the treaty may contain. 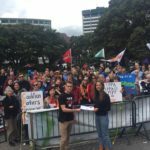 New Zealand must retain the sovereign right to regulate and legislate for the public good even where such actions may be at odds with international corporate interests in areas like health and the environment. “Intellectual property provisions must be balanced so as not to place excessive costs on the consumer and inhibit innovation. We are adamant that PHARMAC must be able to continue to access generic drugs and negotiate lower prices for pharmaceutical drugs. “The general view in Washington is that the TPP will be concluded, but that that is by no means guaranteed. Changes requiring free market access for agricultural goods represent a huge change for countries like Japan and Canada and necessary concessions may only be made in the last round. “In the US itself, the passage of a Trade Promotion Authority and voting up of the ultimate TPP treaty will require active intervention by the President in order to be passed by a majority vote, including some in a reluctant Democrat caucus. “New Zealand has critical defensive issues to be protected in the last stages of the negotiation, but also huge gains in export income and jobs from access to markets including government procurement contracts if it succeeds,” Phil Goff said. NextWhy do we have to rely on Wikileaks?